Having maintained their Ligue 1 status, Jean-Louis Gasset counts on prolonging their undefeated streak in Strasbourg, this Saturday (8pm). 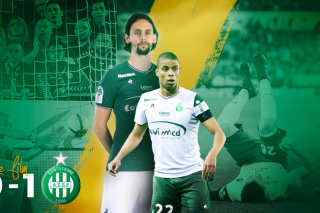 Les Verts will have to however prove themselves to have the same character that they did during the previous two matches if they want to win against Racing Strasbourg who will fight in front of its fans. How did you use the performance delivered by your team against Paris in order to prepare for the match against Strasbourg? We maintained a positive attitude and we spoke about what we did well against an adversary of this caliber. The situation was frustrating, that’s true, but the quality of the performance we delivered is part of the positive points that we take away from this encounter. Few teams have given Paris such a run for their money like we did during the first half. Earning a point against Paris, I’ll take that any day. You made the Cauldron boil during this encounter. Were you satisfied? I wanted to experience the “pressure cooker” effect of the Cauldron and I got it! What pleased me the most was to see the public applaud Mathieu Debuchy when he involuntarily diverted the ball into his team’s own net and scored against his own team. It was magnificent! Everyone was conscious of the effort that he had made during the match and there was nothing to reproach him for. Are you more confident in regards of the end of the season after the performances delivered by the team against Nantes and Paris? Our matches against Nantes and Paris are not the only ones that give us confidence. We haven’t been here for just two days! Of the last five matches we’ve won five and tied five, few teams have had such a steak while playing teams like Paris, Marseille and Lyon. We’ve been progressing for some time now. How did the defensive line of AS Saint-Etienne get its confidence back? 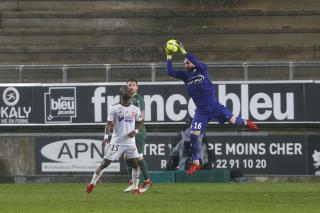 Against Paris, Stéphane Ruffier was as decisive as always. He has full confidence in his very serene centre-back and his two lateral players who are very talented. Because we speak a lot about the contribution of the recruits but several players from the team have gotten back to their peak level of physical performance. Monnet-Paquet or Romain Hamouma also come to mind who are both good players. I’m happy to hear the public applaud them when they leave the field. What is your opinion of the team playing Strasbourg after this short break after having faced Paris? We have a great, undefeated streak at the moment and we’ve attained our first objective, who can stop us now? Strasbourg can stop us if we don’t maintain our level when it comes to work, organization and the quality of the performances we deliver. Saturday, we won’t play a gala match. We have to roll up our sleeves and get to work and fight because Strasbourg is fighting for its survival. But, like I said before the match against Paris, we’ll play to win. The team wants to enjoy, they want to win and they have the sangfroid to do so. We play feeling more liberated now then when we had 32 points and we had to overtake six or seven teams since January to get to this point. We still have six matches and three or four teams to surpass. I don’t want to put any unnecessary pressure of the team: if we manage that all the better, if not we’ll have already obtained our objective. What type of match is the technical staff of Strasbourg, that you know well, preparing for AS Saint-Etienne? Actually, I’ve trained the three members of the current staff and I’ve worked with Thierry Laurey. Strasbourg is a team that is trained to fight and I expect to play in front of a public that is a bit mythic, like our own. Strasbourg was and will become once again a great Football stadium. The public will push them to outdo themselves. They know that each point will be very important. I’m expecting a difficult match. If we believe that the match will be easy, we’ll be quickly disillusioned but if we’re in the same state of mind as Nantes, we’ll deliver a good performance. Kévin Monnet-Paquet : We are enjoying ourselves""